Do you believe everything that comes into contact with your skin should be as gentle, pure and natural as possible? The ATTITUDE Natural Dishwashing Liquid Sensitive Skin Solution is free of chemical contaminants that can be absorbed by the skin. It effectively cleans dishes thanks to its grease-removing formula, without irritating sensitive skin due to its sulfate-free formula. 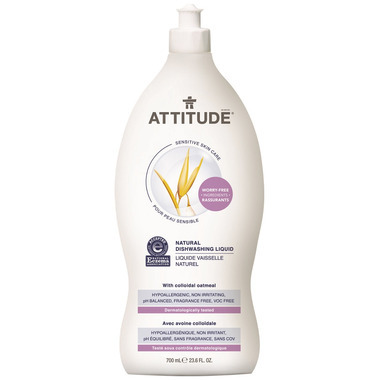 Enriched with colloidal oatmeal, ATTITUDE Natural Dishwashing Liquid is non-irritating, protective, soothing and hydrating. Aqua (solvent), Coco-glucoside (surfactant), Myristyl glucoside (surfactant), Lauryl glucoside (surfactant), Sodium chloride (viscosity controller), Sodium gluconate (chelating agent), Sodium citrate (chelating agent), Triethyl citrate (antioxidant), Raspberry ketone (skin conditioner), Avena sativa (oat) kernel flour (soothing agent), Allyl caproate (emollient). Wonderful dish soap. Does not dry out my hands and my dishes look great.